This is another of the films shown by the Lumière brothers at their first screening of movies in December, 1895 – the event that marks the birth of cinema. 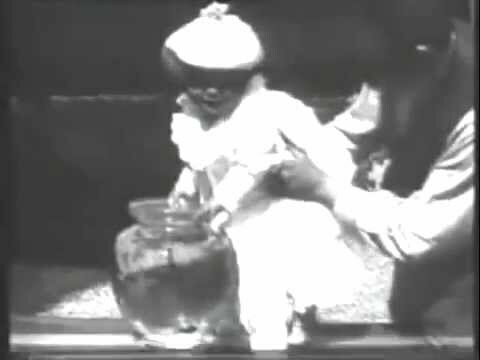 It is a brief film in which a man holds up an infant while the child attempts to grab a goldfish out of a large bowl. It is extraordinary that the baby doesn’t tip the bowl over, spilling water and fish all over. The man is Auguste Lumière, and the child is his daughter, Andrée. The movie demonstrates the “family-oriented” sensibilities of the Lumières. Rather than dancing girls and men in barber shops (as in America at this time), the French are showing us cute children in homey settings. I’m not certain if it was the case that many of the engineers working at Edison were bachelors, or if the Lumières had a stronger sense of attachment to their families, or if this is simply a result of the fact that the Cinématograph was portable, allowing the men to take it home with them, as opposed to the Kinetoscope which had to stay in the studio, and have subjects brought to it to shoot. At any rate, it’s the sort of home movie that many parents would shoot in the ensuing century. Thank you for your comment! It’s sort of fascinating, when you realize that this baby has lived out her life and moved on, yet we still have the legacy of this moment in her youth.